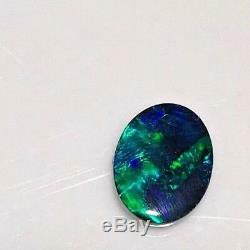 Solid Black Opal 4.05cts Amazing Blues & Greens in Block Sheen Pattern. 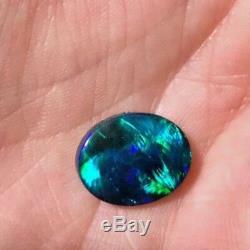 This is just a beautiful black opal and would be perfect made into a ring or as a pendant. The directional block sheen pattern is strong and super vivid, there are amazing flashes of colour with every turn. The colour hues vary from strong royal blue through to iridescent emerald green with flashes of gold and turquoise. Simply put, this is a stunner. I made a pair of cuff links from the same parcel bought several years ago in Lightning Ridge, Black opal capital of the world. The cuff links were snapped up instantly, they were set in white gold and looked stunning. The colours within this piece would also look amazing set in 18ct yellow gold. 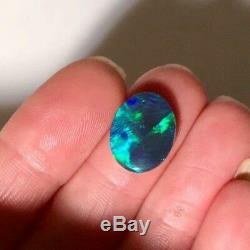 The opal was mined out at the Grawin opal fields and was professionally cut and polished in Lightning Ridge. The resulting stone is excellent, colour, cut and bang for your buck are all well represented. Happy to take offers but no low offers thank you, it is already priced well. Total weight - 4.05cts. Length 14mm x Width 11mm x Depth 3mm. 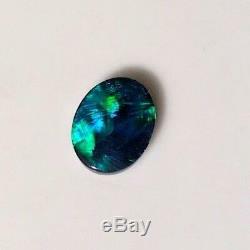 The item "Solid Black Opal 4.05cts Amazing Blues & Greens in Block Sheen Pattern" is in sale since Wednesday, November 28, 2018. This item is in the category "Jewellery & Watches\Loose Diamonds & Gemstones\Loose Gemstones\Opal\Black Opals". The seller is "tigerfinchjewellery" and is located in Chermside, QLD. This item can be shipped worldwide.